The biggest weekend of the year has been and gone, and we’ve been in overdrive to provide you with the best coverage going. 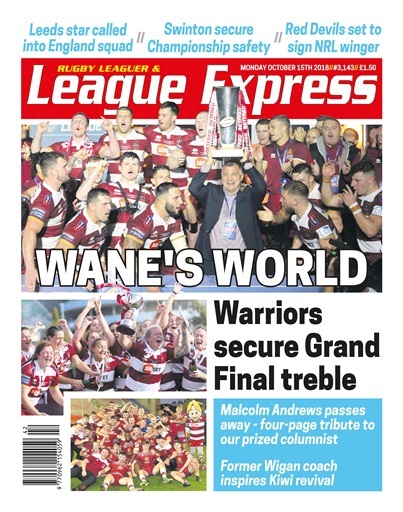 Extensive coverage of the Grand Final, including a two-page report, reaction from both camps and much, much more. A four-page tribute to our incredibly popular writer Malcolm Andrews, who sadly passed away last week. Kris Radlinski outlines Wigan’s recruitment plans following Shaun Wane’s departure. A page Q&A with Widnes CEO James Rule as they continue to plan for 2019. We reveal Salford’s latest signing for next year. One Catalans star is staying, we reveal who. Recruitment updates from Leeds and Castleford. Garry Schofield praises Wigan and compares their defence to that of the NRL Grand Final winner the Sydney Roosters. And we have all the other usual features you have come to expect in League Express.